We Spry Polyurethane Reinforced (Premium Refinish). once our professional refinishing work are done with the job. We spray only PBRA Certified materials made in USA for Porcelain and Fiberglass Baththubs (Long Duration), serving superior heavy duty reglazings since the 90’s, reinforced with our Fluorocarbon Polymer Technology. We reglaze all kinds of porcelain Sinks. We can repair all kinds of holes, chips, cracks, and rust that your sink may have. For one bowl or double bowl sinks (Kitchen and Bathroom sinks). Create beautiful, colorful and fine finish to your Bathroom or Kitchen Countertops with Custom Color or Stone Flecks Luxury Textures (+72 AVAILABLE FINISHES). Nontoxic, Inert and USDA approved. 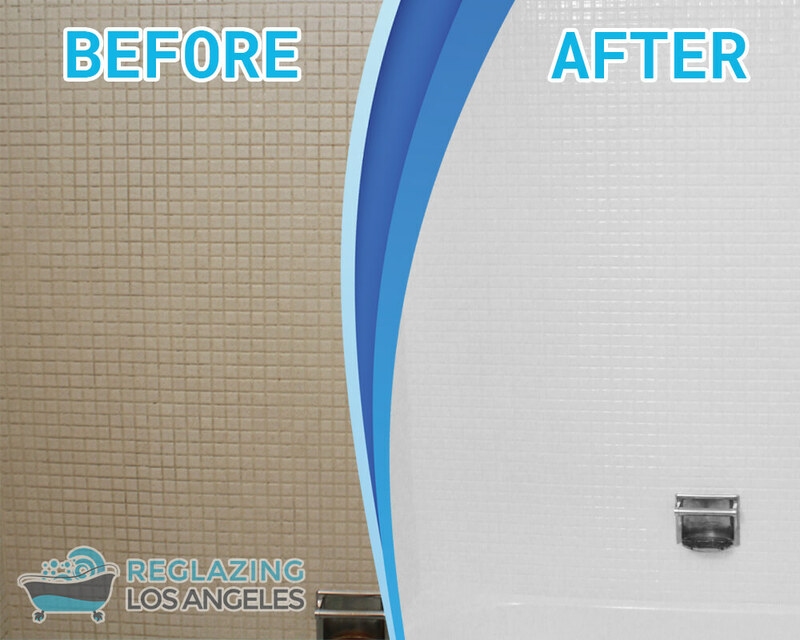 Our Resurfacing/Recolor Service for Tile Walls is very professional, our technicians are specialists in Chemical Cleaning for a long-duration Finish and Premium heavy duty Finish, (Custom Colors and Stone Flecks Textures). We are experts/pros serving professional refinishing services in porcelain and fiberglass surfaces. 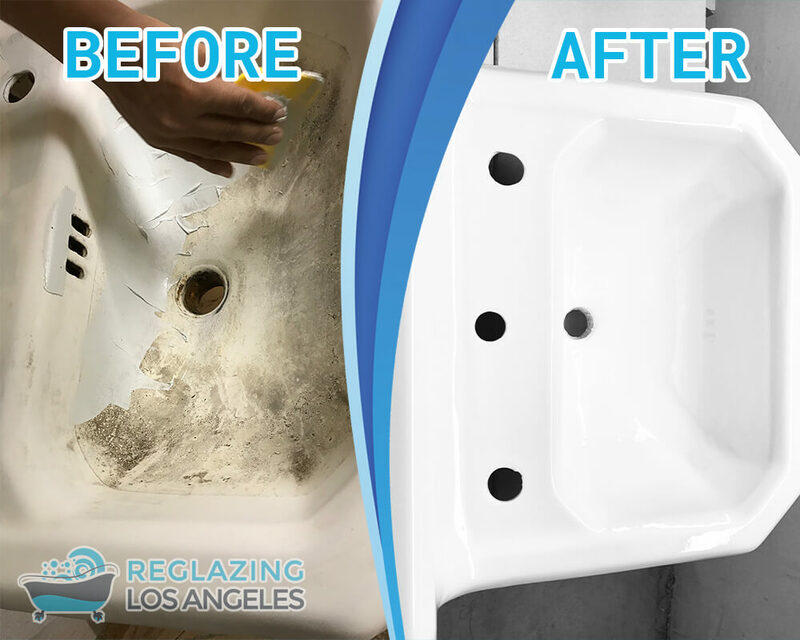 We Reglaze all surfaces on Bathtubs, Bathroom & Kitchen Sinks, Ceramic Tile Counter tops, Tub Enclosures, Stall Showers, Walk in Tubs. As well we do full refinish on Marble Imitation, Formica, Acrylic, Ceramic Tile, and Fiberglass. Full service for Commercial and Residential Customers. Expert in Re-glazing Surfaces in Los Angeles over 27 years experience (Since 1991). Serving all cities 50 miles perimeter around Los Angeles. We offer reasonable prices and the most trustworthy reglaze followed by long durability! Warranty 1 year for workmanship on all material or manufacturing defects comes standard along with our guaranteed 100% customer service. We are pros you can trust, using the very best in refinishing primers and top coats to bring you outstanding shine surface, ease of cleaning, and a heavy duty refinish unlike others, top coatings reinforced with Fluorocarbon Polymer technology, meaning this is one tough coating giving you the the best in durability and a lasting shine for porcelain, fiberglass and ceramic surfaces, with our service you can save a lot of money by avoiding replacing. We use only PBRA® Certified Materials made in USA, only Top Coating and Primers for a Premium Reglazing/Refinishing service. LIC# 1024657, We are certified by law to perform professional Refinishing Services. We do SMS & Email Automatic Appointment Text Reminder. You can view and accept estimates directly from your phone and email. PBRA® Certified Materials made in USA, better finish duration. Check, Cash, Cashme.app, Venmo and others. We reglaze tubs, sinks, countertops, tiles and more in Ceramic and Fiberglass. Tub/tile/countertop Coatings: a chemical and corrosion resistant coating system for protection against abrasion, moisture, corrosive, fumes and chemical splash. 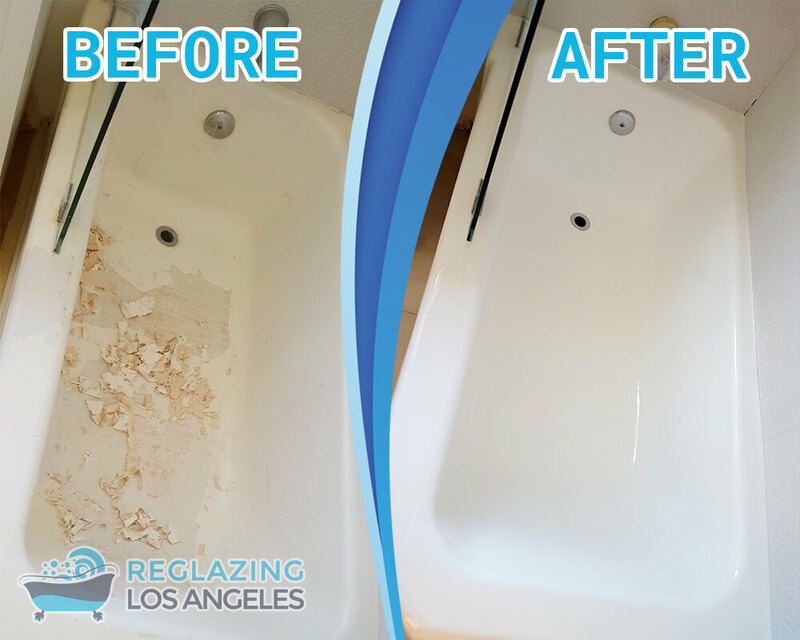 Best In The Business Refinishing, Bathtub Refinishing and Fiberglass Experts, is a complete Kitchen & Bathroom Refinishing Service in Los Angeles county. We Service all of Los Angeles and Surrounding Areas For Residential and Commercial properties. When it comes to Bathtub Refinishing & Repair, an expert refinisher is the solution. Don’t replace… Refinish. We are proud to be one of best using industrial coating certified by PBRA. We specialize in repairs, recolor, restoration and refinishing of all kinds of surfaces such as: Tubs, Bathtubs, Counter tops, Fiberglass Enclosures, Shower Stalls, Fiberglass Crack Repairs and Cracked Fiberglass Tubs Bottom Rebuilds, Garden Tubs, Jetted Tubs, Any Sinks, Ceramic Tile on Bathrooms, Vanities, Cultured Marble & Walk in Tubs. Most Minor Repairs are Free when you hire us to Refinish an Entire Surface on Unit. Give us a call at 1(323) 396-1030 for a FREE Estimate. Text a photo, your info to get quote.